Paul Maunder takes a close look at the rivalry between Wout Van Aert and Mathieu van der Poel in the run-up to their first-ever clash in an elite World Championship. The pundits (and public) have got their much-anticipated showdown in Tabor, but how do the pair compare and how might their paths differ in seasons to come? THE decisions have been made. Wout Van Aert and Mathieu van der Poel will both ride in the Elite men's category of the World Championships in Tabor. Van der Poel threw his hat in first, soon after winning the Dutch national title from his brother David. Then, a little more considered, came Van Aert's announcement (later last week). Both riders tweeted confidently about their ambitions. Van Aert underlined his status by winning last weekend's Zonnebeke Kasteelcross in the Elites against a quality field that included the new national champion Klaas Vantornout and Sven Nys. Van der Poel beat Van Aert to win the World junior title at Koksijde in 2012 whilst Van Aert reversed that result in Hoogerheide twelve months ago at Under-23 level (main image). The pair have been rivals since the junior ranks, so the psychology of the decision is fascinating. Van der Poel declared first, possibly on a wave of euphoria from his national title win. And then what option did Van Aert have but to follow likewise? On this season's form, he's the better rider, and the role of favourite in the Elites sits better on his shoulders. If Van Aert had opted for the Under-23s, with no Van der Poel in the race it would have been a hollow victory. If Van der Poel had opted for the Under-23s, would Van Aert still have chosen to ride in the Elites? Probably. By riding in the Elites category Van Aert knows he has nothing to lose and a rainbow to gain. And the most important people in cyclocross – Belgian newspaper journalists – have got what they wanted. A showdown. The two young guns duelling it out in the Czech mud (or snow). 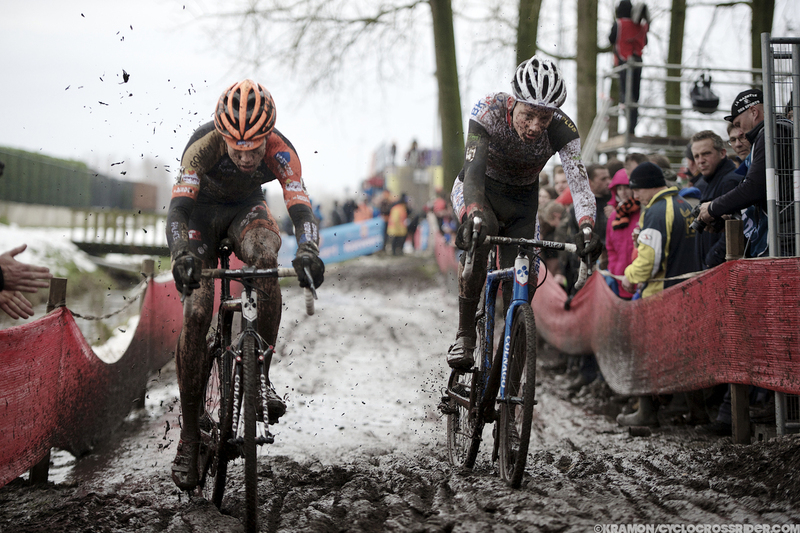 The future of cyclocross, the post-Sven world, will be on display in Tabor. But is this a genuine rivalry, or more like a media fabrication? The best cycling rivalries, those which really capture the imagination of fans, are related to a changing of the guard. Hinault versus Lemond. Cavendish versus Kittel. There is something heroic about an ageing champion defending their pride and reputation against a young pretender. Clearly that's not the case here. This rivalry is about national pride. Thanks largely to Sven Nys and Niels Albert, Belgium have been dominant for some time, but now there is a resurgence in Dutch cyclocross and the Belgians seem unnerved. They need a new hero to replace Sven. Van Aert fits the bill nicely. The new generation three years ago: Van der Poel wins the 2012 World junior title with Van Aert winning silver. In 2013 Van der Poel won his second junior title whilst Van Aert took bronze as a first year Under-23. Sven has had his own rivalries over the years, most notably with Albert, now retired. In their younger days this relationship could be rather bad-tempered, but as they matured Sven and Niels adopted a mutual respect. Sven's career has been so long that he's had the time to have two serious rivalries. In the Under-23 category and following years, his nemesis was Bart Wellens. In the 2003-04 season Wellens beat Nys to both the Gazet van Antwerpen and Superprestige series titles and took his two World Elite crowns in 2003 and 2004 before Nys' first title victory came a year later. The Belgians haven't always had a monopoly on rivalries at the top of the sport. Switzerland's Albert Zweifel won the World Championships four times in a row between 1976-79, on three of those occasions beating his compatriot Peter Frischknecht - father of Thomas Frischknecht who went on to win the Junior and Amateur World Championships. Even the ultimate Flandrian hero, Erik De Vlaeminck, had a serious rival. The seven times World Champion fought many epic battles with Albert Van Damme, The Lion of Laarne. Van Damme, a florist by trade, specialised in winning the Belgian Championship, taking the title six times to De Vlaeminck's four. And it was Van Damme who ended De Vlaeminck's seven year run at the Worlds, taking his only rainbow jersey in 1974. The following year, while De Vlaeminck's career went into a tailspin of recreational drugs and alcohol, his brother Roger took the jersey back for the family. Can we expect that the rivalry between Mathieu van der Poel and Wout Van Aert will dominate the sport for many years to come? It's an appealing thought (unless you happen to be Lars van der Haar or Kevin Pauwels). The most interesting difference between them is that of style. Van der Poel is more reckless, more daring. He likes finding different lines, and is prone to a bit of showboating. Van Aert is more controlled, and uses his team when he can. At Hamme in November (which ended in the sprint pictured above) we saw that neither are afraid to take command of a race. Van Aert prefers a heavy course but doesn't like snow, which could potentially make Tabor challenging for him. In a recent interview Van Aert confessed to feeling the pressure of Belgian expectations, and went on to call road racing boring. And here we get to the heart of the matter. Van Aert is a pure cyclocross racer. Cut him and he would bleed mud. Van der Poel, however, already has an impressive palmares on the road. Just like his father Adri, Mathieu can mix it with the best on the road and the dirt. In 2013, on a steep lane in the outskirts of Florence he attacked the leading group in the Junior World Road Race Championship and soloed to victory. Is it, in fact, the smooth tarmac of Tuscany that gives us a hint of the future? Might we see Van Aert mature into Sven Nys' heir, while Van der Poel focuses on the road? Put another way, Van Aert tackles the Koppenberg in November, Van der Poel in April? The wintry fields of Tabor will not answer this question definitively. But if he sees Van Aert's back wheel crunching away from him through the snow, might Van der Poel start wishing for the swish of tubular on tarmac and the warm glow of a Tuscan afternoon?